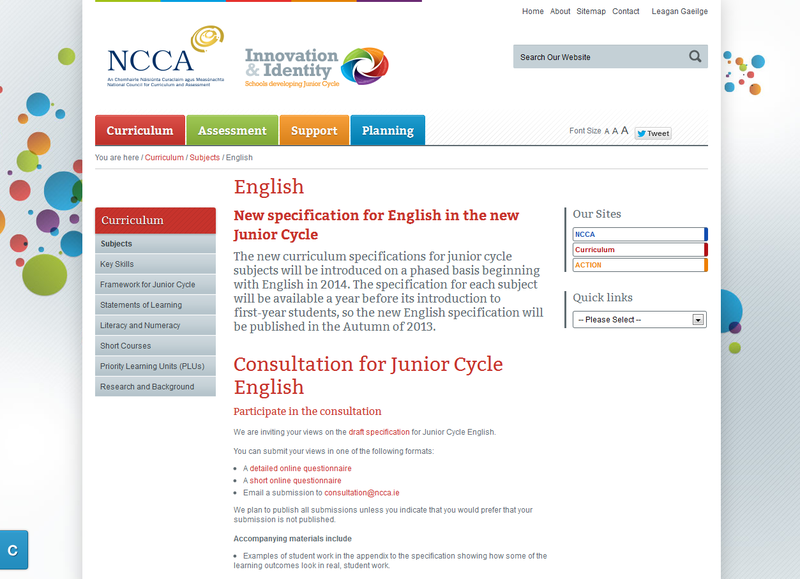 The NCCA are currently looking for feedback on a document regarding the shape of the new Junior Certificate English course for 2014 that they have entitled a 'Draft Specification'. I've gone through the document myself and posted a reply on their detailed online questionnaire. I'm not posting my own views in this blog post as I wouldn't like to unduly influence opinion and much more importantly the document is still at a consultation stage. It's obviously so so important that as many English teachers as possible get in touch to highlight any benefits, changes or worries/concerns that they may have with the new J.C. plans. All the relevant links can be found here on the NCCA website. 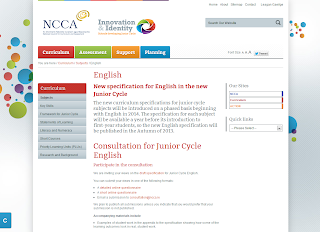 Posted below is a general overview of the new Junior Certificate program the NCCA have made available to teachers with accompanying speaker notes.